LONDON--(BUSINESS WIRE)--Technavio has announced the release of their research report on the global mercury analyzer market for the forecast period 2019-2023. This global mercury analyzer market analysis report segments the market by end-users (environmental testing, food and agriculture, and healthcare) and geography (Asia, Europe, North America, and ROW). 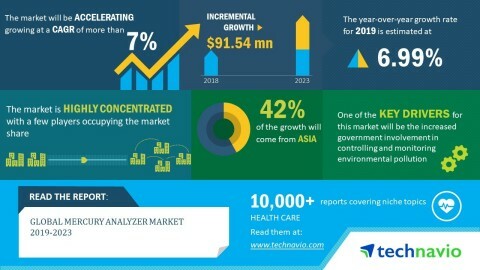 Technavio has announced the release of their research report on the global mercury analyzer market for the forecast period 2019-2023.